Lesson: You snooze, you loose! Since we live in an area that boarders on tropical in summer our winters are pretty mild If we are lucky we'll get 1-2 good snowfalls in winter. The snows may not stay for a full day so if we wake up to the silence and erie glow of a snowy morning we know we need to move quickly so we can enjoy it while it lasts! Yes, I'm aware that not everyone sees snow days as a blessing. Yes, they mess with the work and school schedules. They make going anywhere a challenge. At the same time, snow days force us to slow down. To take a break for the normal daily craziness. To spend time doing things we don't always get to do. As annoying as it can be to have upheaval it is also good for us. It helps us not to take things for granted. Snow days are fleeting (here at least) and the kids will be grown and gone before we know it so a snow days is a great family bonding and memory making day! 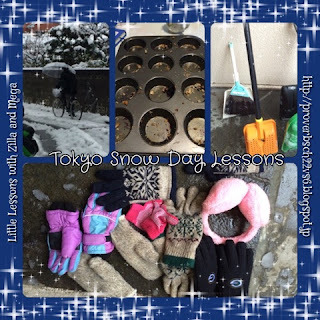 Before getting into the snow day ideas I have some Dos and Don'ts I'd love to share with the neighbors! - Don't ride your bike while holding an umbrella in one hand on a snowy/slushy/icy road. - Do wear proper shoes on a snowy day. - Don't try to shovel with a broom and dust pan, especially when it isn't powder snow. - Do get a small shovel so you can make a safe walking space in front of your house. - Don't leave home without checking to see if you can get to where you want to go. - Do make the most of the extra time at home if you can't get out. So, here is how we spend a snow day. Wake up - Listen to the silence. Stay in bed and just be. Have the kids listen and identify what sounds different. I must admit that I sometimes rush this step and usually end up regretting that. With the impending change from snow to rain we're rather anxious to get outside as quickly as possible. One thing we do is prepare something warm to eat & drink when we come in. Blueberry muffins are easy to throw together & pop in the oven. I also prepare a thermos of hot cocoa for the kids at a drinkable temperature. Another thing to do is have a warm bath waiting. The wet/rainy/slushy/sloppy snow will chill a body faster than lovely fluffy snow. Kids are especially susceptible to hypothermia and frostbite as they can tolerate a lot when they are too busy having fun to notice! One other essential preparation is to have the genkan (entry area) ready for wetness. We put away all the extra shoes, have hangers ready for wet snow gear and towels for wiping off so we don't drip all the way to the bathroom.